Everless’ time is currency concept was definitely the thing that appealed to me the most when I first heard of it, and this remains the best part of the story now that I’ve finished reading it. I don’t know if the author took inspiration for this concept on that Justin Timberlake movie—In Time—but there were some similarities there. Not enough to make the book seem like a copy of the movie, though. Either way, I thought that the world the author created here was pretty impressive. Aside from the idea that time can turn into blood-iron coins that, if digested, add days/months/years to a person’s life, the story also comes with its own mythology about two ancient and powerful beings, a Sorceress and an Alchemist, who, in their quest to keep their immortality, have turn into enemies. All of that is the background for the world inhabited by Jules, a girl who grew up in Everless in the company of the two very rich Gerlings brothers, Roan and Liam—one who Jules believes to be good, the other bad, but things might not be as they seem at first. After an accident, Jules and her father are forced to flee Everless and that’s when all the starving and struggling to survive begins. Many years later, out of option, Jules decides to go against her father’s warnings and returns to Everless to work as a servant for the wedding between Roan and the Queen’s adoptive daughter. My first issue with the story starts here, because Jule’s father clearly knows something big. Something that has the potential to endanger his daughter’s life, but instead of telling her what it is, he simply begs her not to go back to Everless without giving her a reason. Jules got on my nerves plenty of times later, but I couldn’t blame her initial decision to go despite her father’s vague warnings. The man was practically dying, and I would’ve been much more irritated at her if she had sat back and done nothing. Later on, her father gets another chance to tell her the truth, but decides to keep being vague until he can tell her nothing more. *sighs* All this holding back information obviously serves no other purpose but to keep the main character in the dark until the big reveal. It works, but it’s a little annoying. Something else that annoyed me a lot was Jules’ recklessness, especially toward the end. It was incredibly hard to follow her line of thought when she made decisions that were clearly not very smart and were bound to end up in disaster—as they did. I found myself rolling my eyes more than once when it came to her complete lack of strategy. It seemed that she often sent a prayer up, wished for the best scenario and jumped into the most dangerous situations, then she’d blame her lack of luck for the obvious outcome. Girl, please! She wasn’t all bad as a protagonist, but she wasn’t all that likable, either. Her impulsiveness and naivety made it hard for me to connect with her. Despite having a feeling that things weren’t as they seemed, Jules often stuck with blurry memories from her childhood, ideas her father had put in her head and concepts that no longer applied. She didn’t try to see things from a different perspective, no matter how many signs there were that maybe, just maybe, things weren’t exactly how she thought. This, for example, is the case when it comes to the Gerlings brothers. I don’t know if everyone will see things the way I did, but I could see from the start where that was leading. Jules was also quick to trust the people around her. Although, I can’t quite blame her for the big reveal in the end, because not even I could see that one. The villain caught me totally by surprise—great job on that part—so I’ll cute Jules some slack. Speaking of the villain, I think her motivation works well and the whole thing behind the big reveal was smart and well-planned. That and the world the author created were my favorite things about the book by far! But I was confused about how the villain got that “breaking the heart” solution. Was that just a guess she was willing to try because she’d failed in her previous attempts? Or was she sure it’d work with the right person? If so, how did she get that information? Maybe the sequel will bring the answer to that and to some other questions that were left unanswered. As to the romance, I’m guessing that will be left for the sequel, too. At least I can’t complain about the direction it seems to be taking, because Jules’ infatuation with her childhood crush made no sense whatsoever. She hadn’t seen the guy in ages, but I was supposed to believe she was so in love with him still? Other than that, the whole thing came a little too close to cheating for my taste, and Jules never once showed any sign of regret for lusting after another woman’s man (something that was even worse after she found out the truth about the princess). 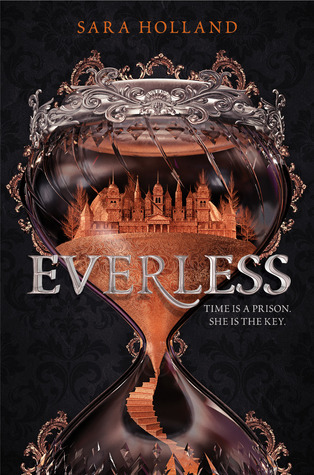 Despite my reservations, Everless was a quick, entertaining read. I don’t imagine it’ll be on my top reads of the year list, but it wasn’t bad, either. Besides, the book also gets extra points for that pretty cover!